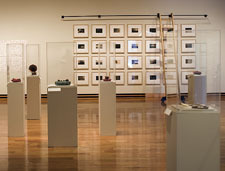 The UW Art Department Faculty Exhibition is displayed every three years and includes installation, painting, printmaking, graphic design, sculpture, small metals and drawing. This year’s exhibition includes work by Nathan Abel, Diana Baumbach, Ashley Hope Carlisle, Leah Hardy, Margaret Haydon, Ricki Klages, David Jones, Patrick Kikut, Jessica Perry, Mark Ritchie, Doug Russell, Shelby Shadwell and Jenny Venn. 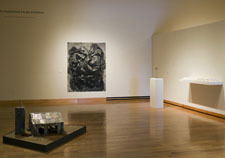 Middle: Installation view of UW Art Department Faculty Exhibition. Includes work by Margaret Haydon and Shelby Shadwell. 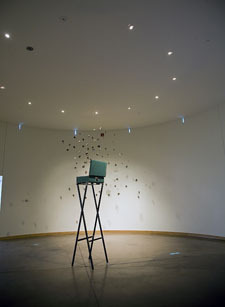 Bottom: Installation view of UW Art Department Faculty Exhibition.